Native Foods, a Natural 1st Pick | Bite Me. We had to leave our condo for a few days, as it is not available for a few days. In the intervening time, we went inland to a comfortable hotel. Its hotter and dryer the further you get from the ocean, but this location has other benefits. Of course, when I e-serached out vegan restaurants in the area, I just about lept from my chair when I saw all the incredible options. There are VEGAN chain restaurants!! Many of them. And other independent bakery, restaurants and cafes, all with the “soul” purpose of being cruelty-free, earth-friendly and delicious. This is heaven. And its proper title is “Native Foods”. 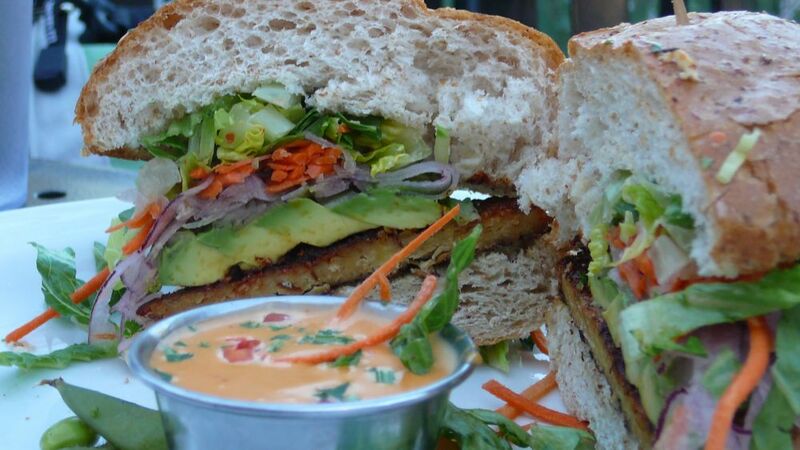 “Native Foods” is an all vegan, organic restaurant, serving a wide range of sumptuous eats for over 17 years. I have used some of the recipes by the original owner and founder, Tanya Petrovna. 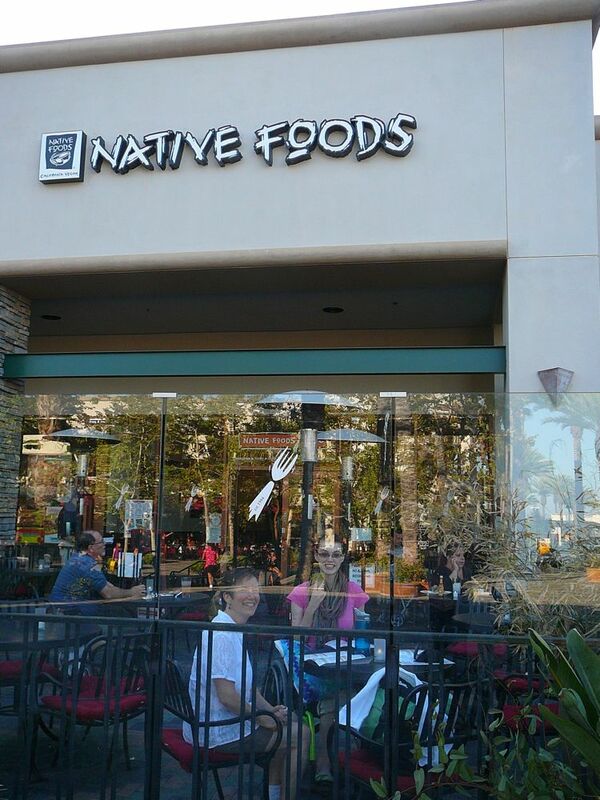 I was intrigued by the wide demographic of people eating at “Native Foods”. Forget the stereotype that all vegans are dirty hippies and social misfits. There is no profile for a vegan or vegetarian. Its very telling that a recent study found 3.2% of all adult Americans to be vegetarians, about 7.3 million people, of whom a million are vegans. These figures have nothing on Indian, where 40% of the population are vegetarian. How cool is that? 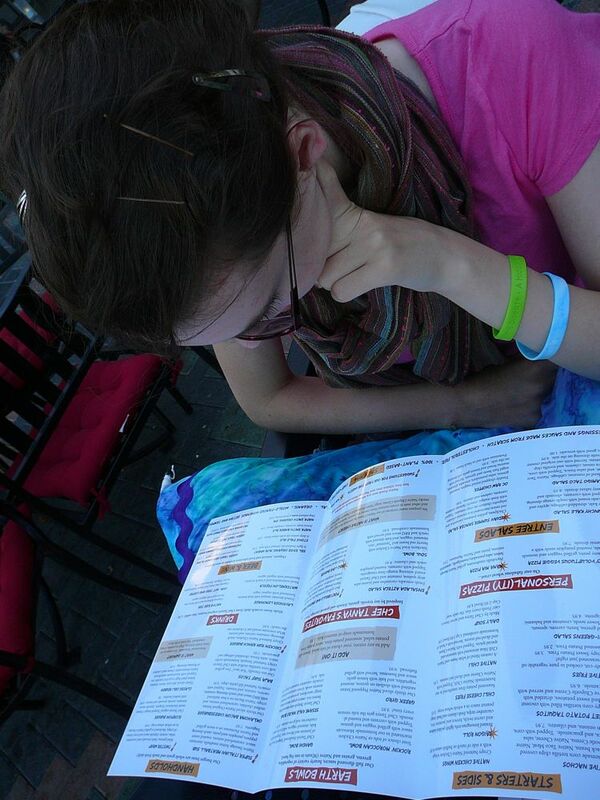 I was so excited to visit a place where I could eat EVERYTHING on the menu, and without needing to ask 20 questions about the ingredients, its preparations etc. Check out their menu here! It was so impossible to decide what sounded best. But I felt pretty sure I was in a mood for one of their legendary burgers. I have never eaten a conventional Oklahoma bacon cheeseburger, and as this combined so many things I do not eat/have food sensitivities to, I opted for this mother-of-all-burgers. They make their own fake ‘meats’ and some of their cheezes, all the sauces and toppings are house-made too. My reaction? NOMNOMNOMYUMMYYYY! It was so tasty!!!!!!!! Out of the world. The “bacon” tasted just like the real thing, and the cheeze was stringy (Daiya) and the vegies crisp and fresh. It was to die for, ironically enough. 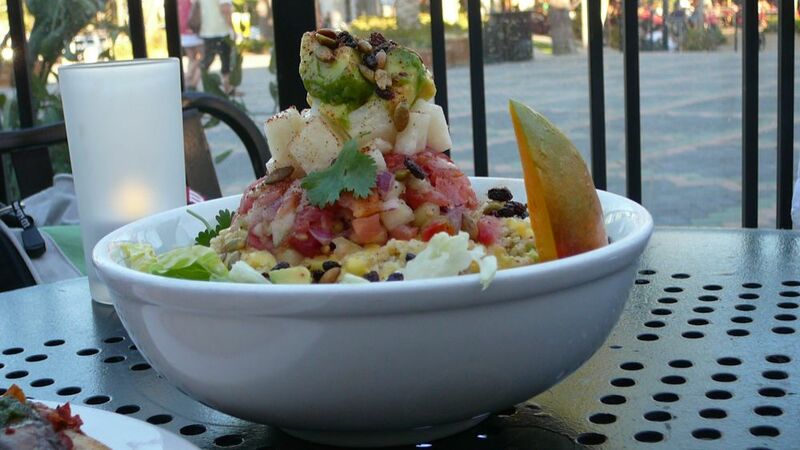 My aunt, mum and I all shared an ‘Aztec’ salad, which was so beautiful I didn’t want to dig in (almost). Another exciting bonus of an all vegan restaurant was that I could have a little taste of everyone meal. Mum and I ended up swapping burgers, half and half. 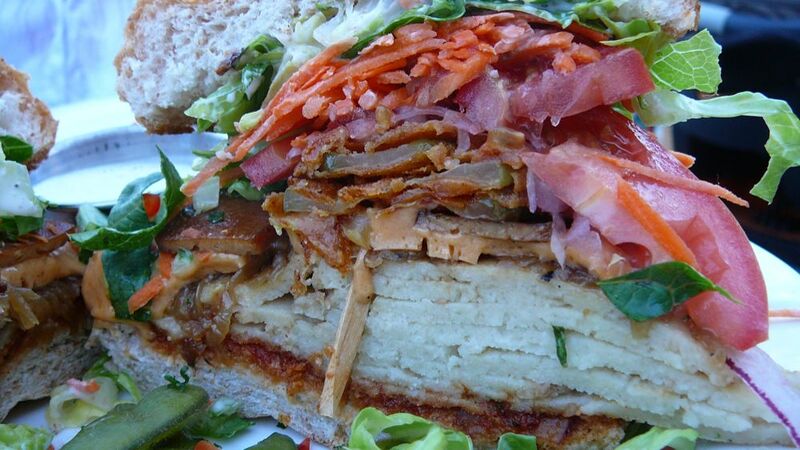 Mum ordered the ‘scorpion’ burger, which was a blackened tempeh burger with chipolte sauce. WOW. 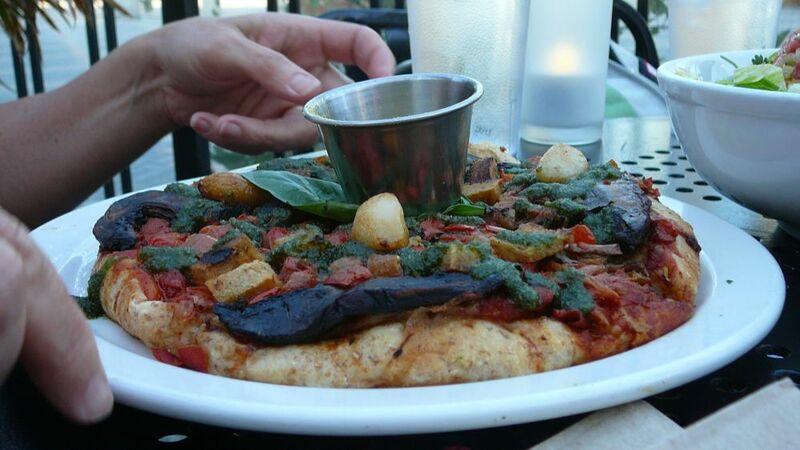 Nancy tried their Very Voluptuous Veggie Pizza which is topped with “Creamy pesto, grilled veggies and kale, roasted pumpkin seeds with a balsamic drizzle.” Their house-made Parmesan was dreamy. All in all it was the best meal I have ever had at a restaurant, vegan or otherwise!! What a blissful evening. The burger was so filling that I actually couldn’t finish it. I am not used to eating foods that are so jam-packed with protein (ie: really filling). Heaven between a fluffy bun. If you are ever in the Southern California or Chicago area, this is a MUST stop. It was rated the best veg burger in the area. If you have ever wanted to try something vegetarian, but were worried about how delicious something made from plants could be (do you call vegetables ‘rabbit food?’)…well then this place is for you! The peanut butter parfait we had for dessert was finished off so quickly that I didn’t take a picture. But rest assured it was beautiful and amazing! I have never had a parfait, so how cool was it that my first parfait was vegan? I forgot all about my PICC-line-less arm, which is just feeling a bit abused.